Wonderful views of Kathmandu Valley and Pokhara City. Awesome view of Rupa Tal (Lake), Begnas Tal, and Fewa Tal. Bird's eye view of Jomsom Village. Breathtaking views of Mt. Manaslu, Annapurna, Fishtail, Dhaulagiri & Nilgiri. Cover all tour in just 5 hours from Kathmandu. 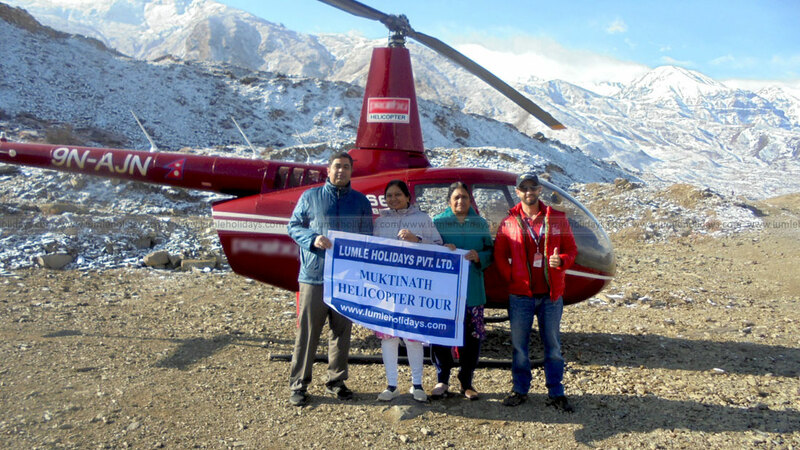 Adventurous & easiest Helicopter Yatra to Muktinath Temple. Appropriate option for the limited time traveler. Muktinath Tour by Helicopter is one of the easiest ways to visit Muktinath Temple in a just short period of time. This is a private Muktinath Tour Package for the group of 1 to 6 people in which you will be flown directly to Muktinath Temple either from Kathmandu or Pokhara. You will be picked up from the hotel at early morning then, transferred to Domestic Airport and if the weather permits fly to Muktinath Temple perform pooja/worship and finally fly back to Kathmandu. 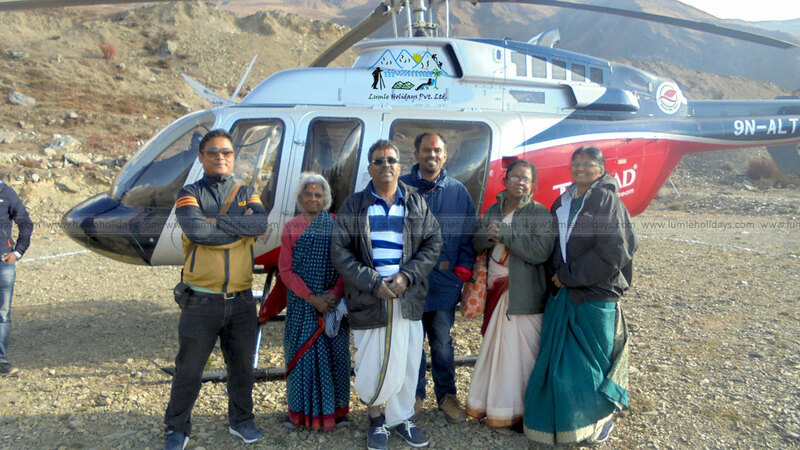 Muktinath Helicopter Tour is the five hours Heli Tour Package from Kathmandu in which one and half hour time will be consumed on flying (one way) and two hours grounded time for Muktinath God Darshan. Muktinath Temple is located in the Annapurna Conservation Area at Mustang District of Nepal at an altitude of 3710 meters and 20 km North-East of Jomsom. The Temple is popularly known as "Muktinath Dham" for "Hindus" and "Chumig Gyatsa" for "Buddhist". Hindus worshipped the place as "Mukti Kshetra", from where people are liberated or obtain Moksha. Similarly, Buddhists worship the deity as one of the "Bodhisattvas". It is said that Guru Rinpoche, the founder of Tibetan Buddhism and also known as Padmasambhava, mediated here on his way to Tibet. Muktinath is the only place on earth where one can find all five elements – Fire, Water, Sky, Earth, and Air. They found in their own form at the place near Jwalamai Devi Temple. Thus, is known as Sri Murthy Mahatmyam. Muktinath Temple word is derived from "Mukti" and "Nath". "Mukti" means "Salvation or Nirvana" and "Nath" means "God or Master". Mukti holds great significance for all spiritual people in the South Asian sub-continent. Muktinath this Sanskrit name itself has religious overtone and a sort of emotional ring to it for the devout Hindus. Muktinath Yatra by Road has never been a quick or easy journey due to the geographical difficulties and ever-changing mountain weather. Muktinath Temple can be reached via rough dirt roads drive spending lots of days by four-wheeler jeep from Beni in the south or via hiking from the East or North crossing Thorong-La Pass Mountain at 5416 meters. 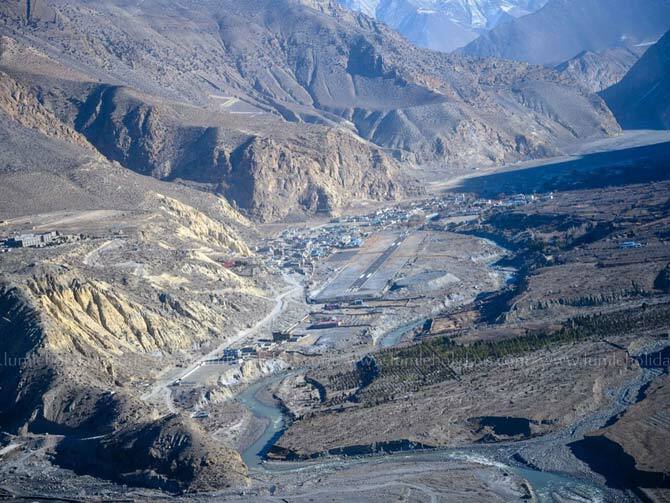 Therefore, if you lack the time and desire to visit Muktinath Temple in just a day then, this "Muktinath Helicopter Tour" might become beneficial to you. The first best time to visit Muktinath Temple of a year starts from March till June and second begins from September till December. You will find the blue sky and clear climate throughout these months. You can spot lots of snow-capped mountains ranging from Langtang to Annapurna in the north direction while flying by helicopter. 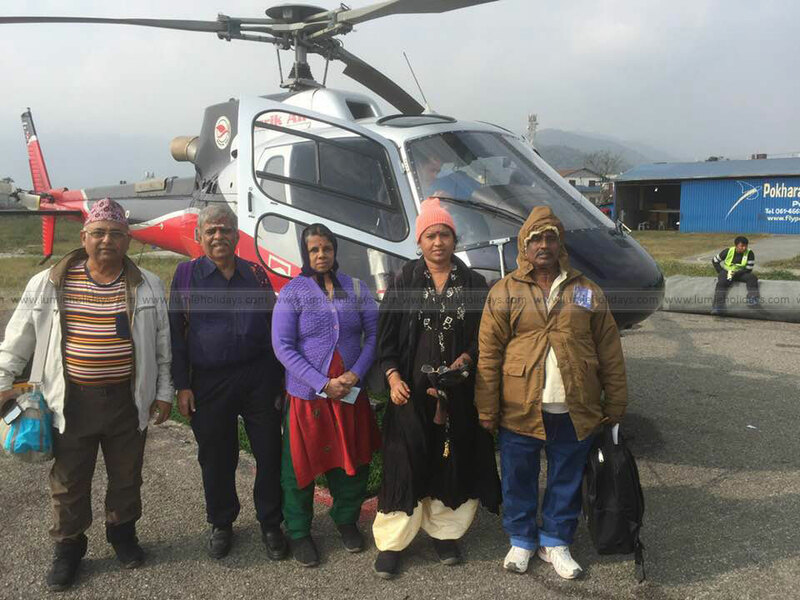 Nowadays Helicopter is also available from Pokhara. So, there are two choices available for Muktinath Tour by Helicopter. One is fly directly from Kathmandu to Muktinath Temple and another is from Pokhara. Pokhara is 206 km far from Kathmandu and takes 6 to 7 hours by a private car drive or 25 minutes by regular flight. Muktinath Temple is in 45 minutes flying distance by Helicopter from Pokhara and 2 hours grounded time will be provided to visit the temple. Therefore, Muktinath Yatra by Helicopter from Pokhara is just a 4 hours Heli Tour Package. Lumle Holidays will assist you to charter a helicopter, take you to the temple, arrange horses to reach up to the temple perform pooja/worship and fly back to Kathmandu or Pokhara. Our Helicopter Tour itinerary goes as follows. You will be welcome at the airport by our representative. Transfer to hotel, 7 km. A brief introduction to your whole program. Day 2: Kathmandu to Muktinath by Helicopter. 6:00 AM: pick up from the hotel and transfer to airport. As per the weather condition fly to Muktinath. Muktinath is in 1 hour 30 mins flying distance from Kathmandu. The helicopter will be landed at Ranipauwa. Ride on a horse from base till temple gate, 15 mins. Change clothes and take bath on 108 chilled holy waterspouts and two Holy Kunda. Change clothes and perform pooja at the temple. Horse ride back to base. Day 3: Sightseeing in Kathmandu. 10:00 AM: proceed to visit UNESCO World Heritage Site like Pashupatinath Temple, Bouddhanath Stupa, Swoyambunath Temple and Kathmandu Durbar Square. Back to hotel and free time. Hotel checks out time 12 noon. Transfer to airport to your onward destination. Airport Pick up & Drop Transportation by private air-conditioned vehicle. Twin Bed Room sharing hotel accommodation with breakfast at Kathmandu based on five-star hotel. 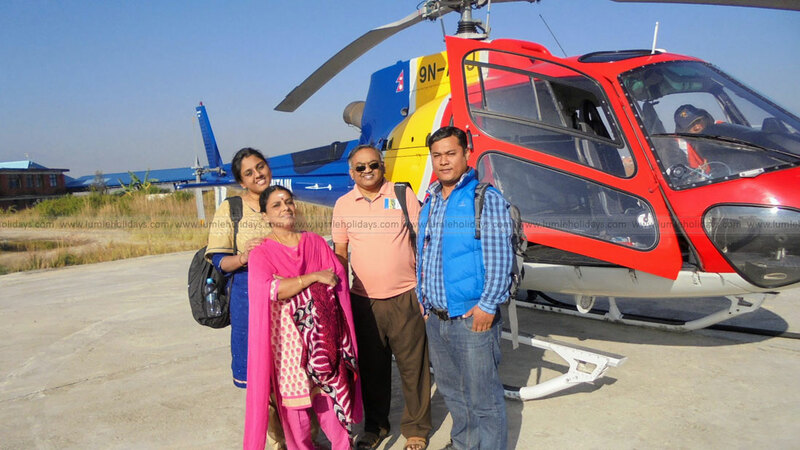 Kathmandu to Muktinath and back by chartered helicopter. Sightseeing in Kathmandu & Pokhara is escorted by an English speaking guide. Sightseeing in Kathmandu by private air-conditioned vehicle. All required documents and government taxes. We are specialized in operating Muktinath Helicopter Tour and above itinerary is fully customizable and can be modified as per your requirement. Please contact us to collect more information on Muktinath Darshan by Helicopter and its fares from Kathmandu or Pokhara or Jomsom. We will help you to visit the temple by helicopter at the affordable cost.